Now I am not a supporter of children being sat in front of a TV or computer for extended periods of time, but I am also very conscious as a parent that technology is now very prevalent within our children’s worlds and our children’s education. Most students within high schools will own a netbook, iPad or laptop in which they will do their studies. Quite recently we are seeing that children as young as 6 are utilising either individually or as a collective group iPads and computers in the classroom. 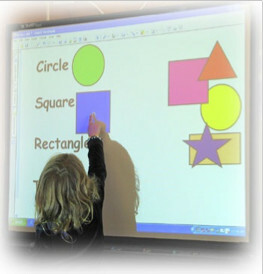 Even the common black board has been replaced by interactive “smartboards”. I feel like it’s our job as parents to embrace technology and all that it can offer, whilst teaching our children restraint and boundaries. I took some time and thought about how I use technology and how easy and accessible information is to me now. I just need to take my phone out of my pocket! My shopping list can be updated instantaneously and synced to my husband’s, while he's shopping for groceries at the supermarket! Technology can offer so many positives to our busy lives and to a child’s education, but we must be cautious in our motives for use. My son, who struggles to keep up in the class room sometimes, gets the opportunity to “catch up” by playing maths games at home or doing his reading interactively. If I want to play a strategic memory game (to stop me from losing my mind!) I can do that whenever I have a few minutes to spare. I feel it’s necessary to embrace technology, to give our children the tools to support them to improve, give them opportunities to be who they want to be and who we need them to be, as the future generation. We want to ensure that our children help to shape the culture of our next generations and whether we like it or not, technology isn’t slowing down and will always be a part of that! I do set limits on my children’s activity online! I do make sure I know what apps, games and websites they are using! I do believe that technology is imperative to our children’s future! I do believe that technology enhances education! I do believe that as parents we must remain in control and give our children limits with screen time! I do believe in the power of creativity and the importance of children running outside, riding bikes and kicking a ball! Children must be children, but I think that we must stop being so afraid of technology and embrace the future!